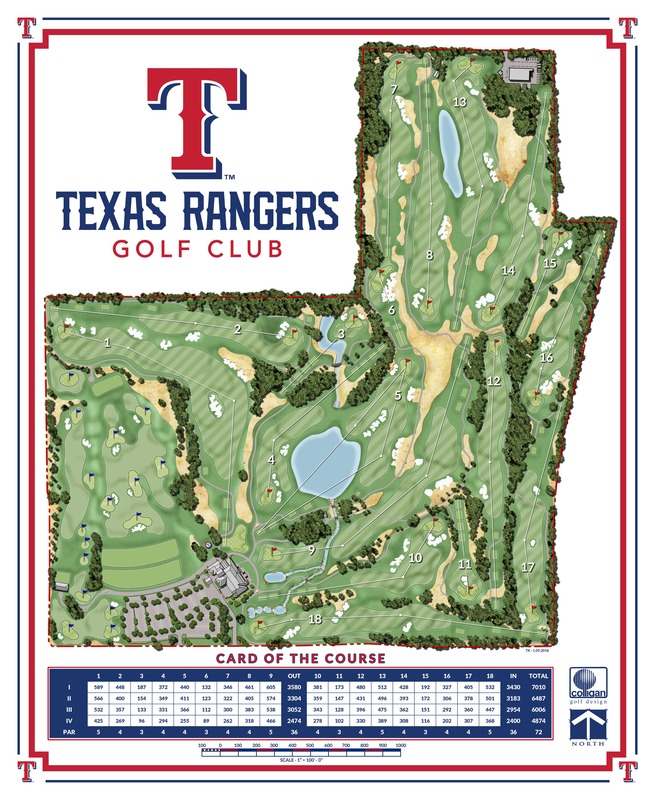 Arlington Golf and the Texas Rangers have partnered to build the world’s only Major League Baseball-branded golf course — the Texas Rangers Golf Club — which opened in February 2019. 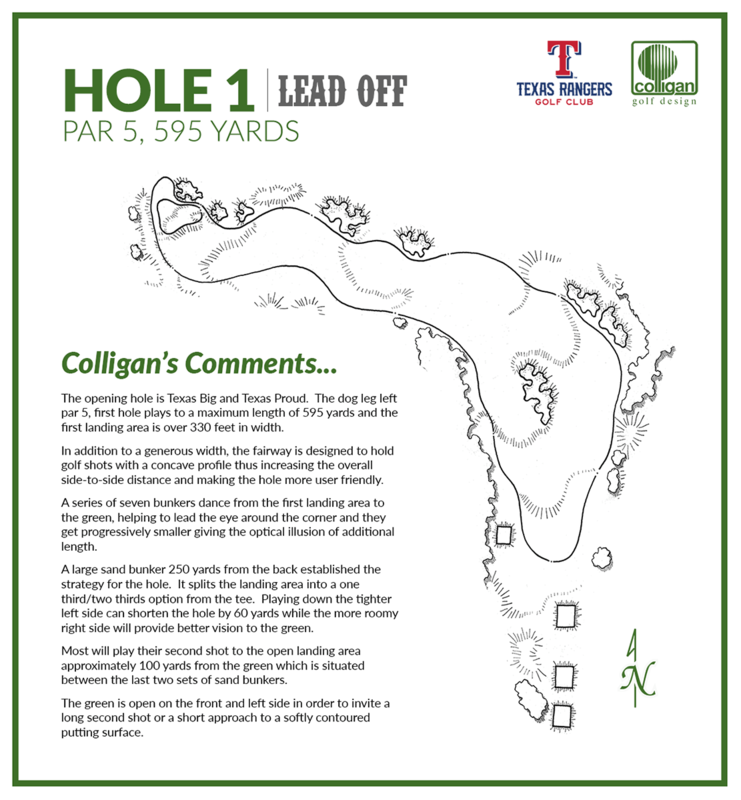 This collaborative branding partnership, along with $24 million in course renovations, affords the opportunity for Arlington to offer a destination golf course for both Arlington residents and visitors alike. 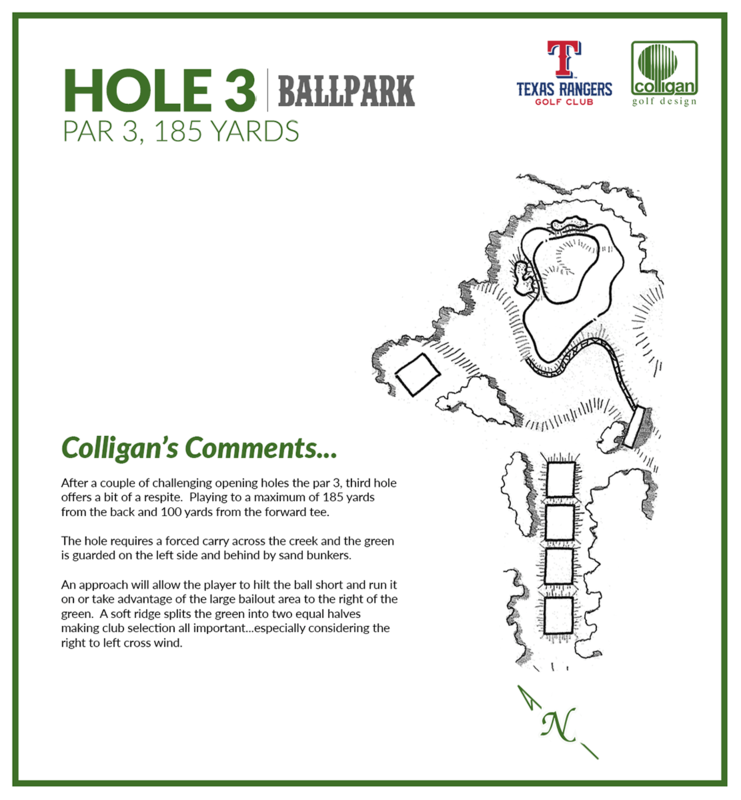 “As the world’s only MLB-themed golf course, this course is sure to be a ‘bucket list’ item for baseball fans across the globe, especially our Rangers fan right here in Arlington,” Mayor Jeff Williams said. 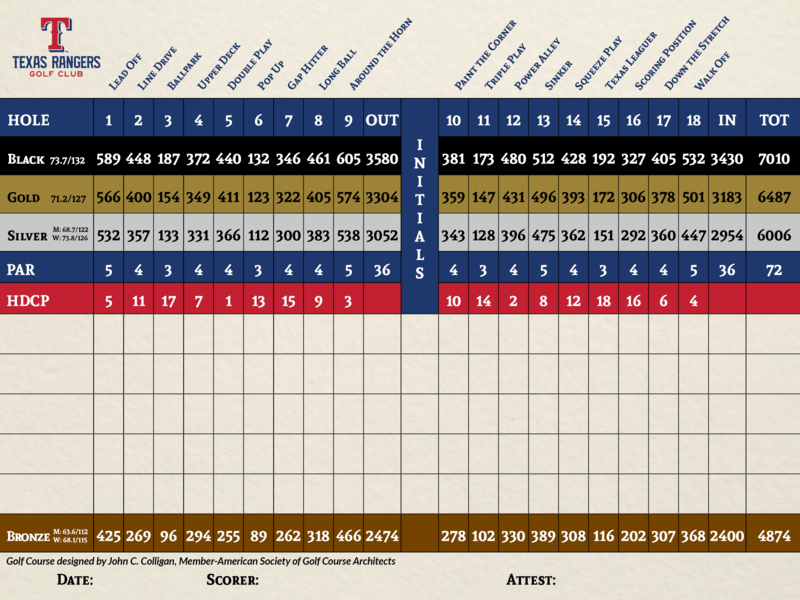 The golf club is open to the public seven days a week. 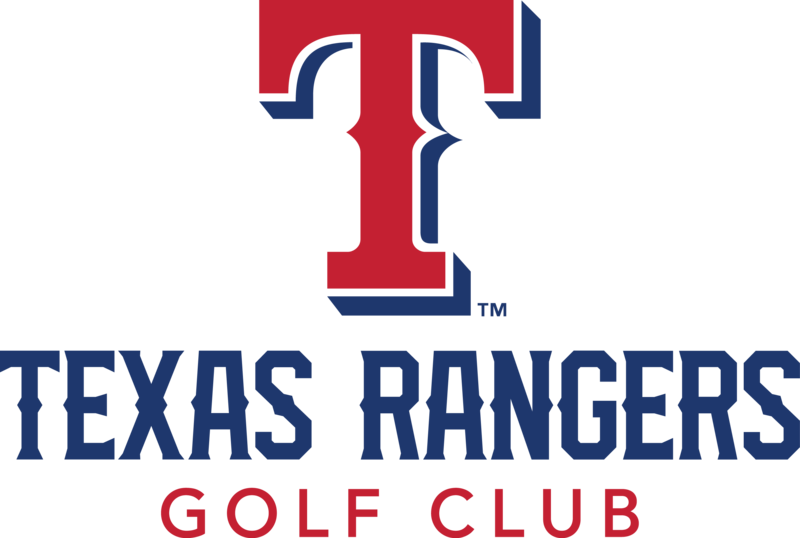 Texas Rangers Golf Club is the closest 18-hole golf course to Arlington’s Entertainment District, offering a chance to play golf in conjunction with a visit to a Dallas Cowboys or Texas Rangers Game, TexasLive!, or the numerous other events at AT&T Stadium, Globe Life Park, UTA or downtown Arlington. 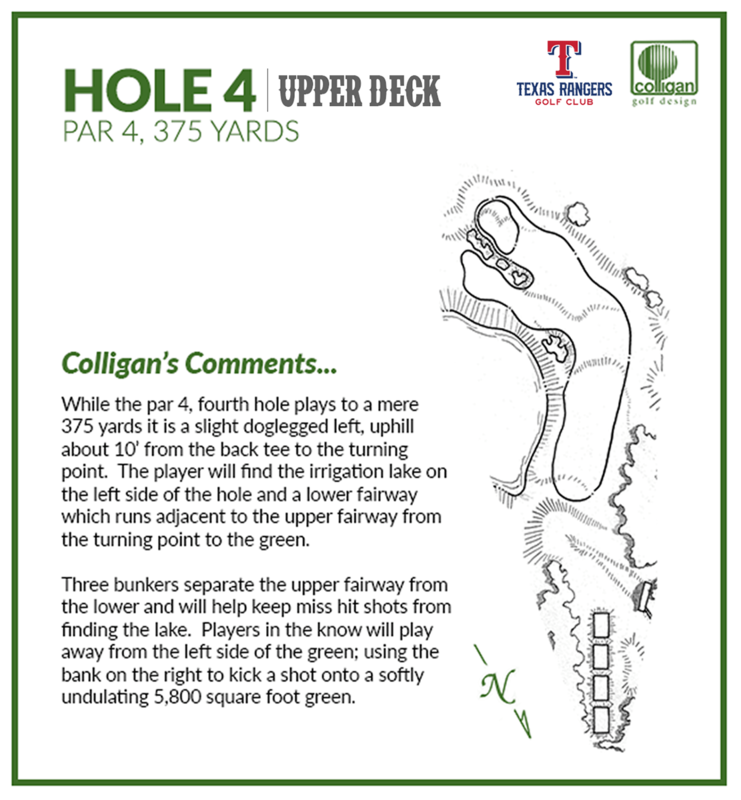 A $24 million project, Texas Rangers Golf Club involved a total renovation and updated routing of the existing golf course with improved turf grasses and additional water features. 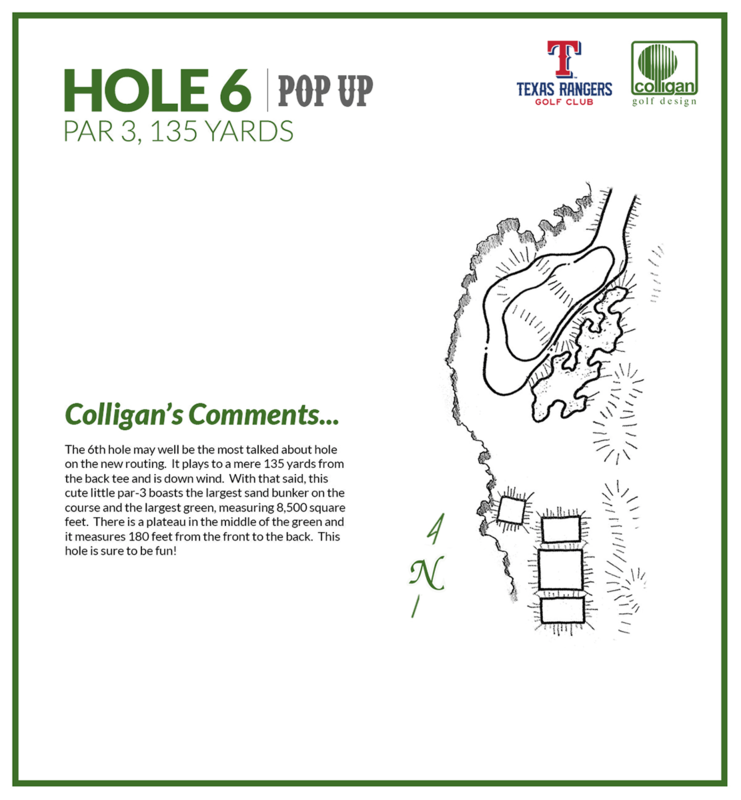 A new 33,871-square-foot clubhouse, set to open in early 2020, will feature a full-service restaurant and bar, covered patio overlooking the golf course, pro shop, locker rooms, and numerous rental and event spaces. 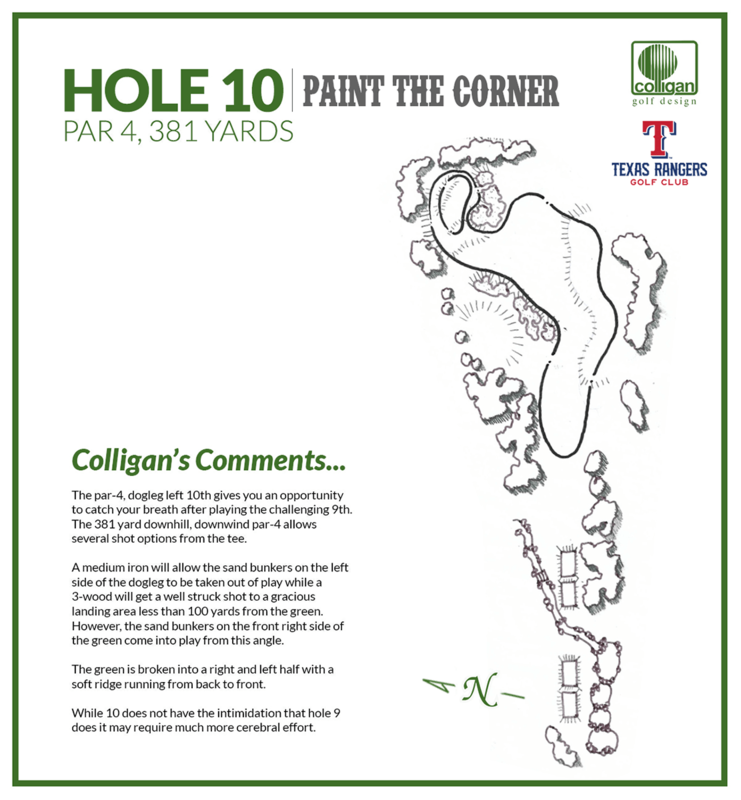 In the interim, the golf club will operate out of a temporary clubhouse that includes a fully-stocked golf shop, small food & beverage operation, and restrooms. 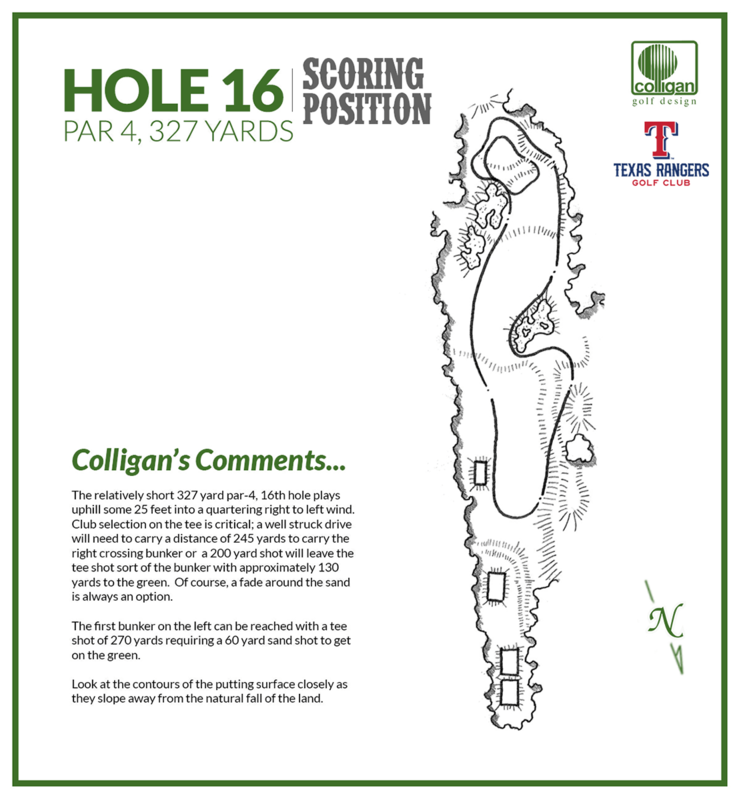 The club’s 23-acre practice area includes a double-ended range, a practice hole and two short game areas – one with four greens and the other with one green. 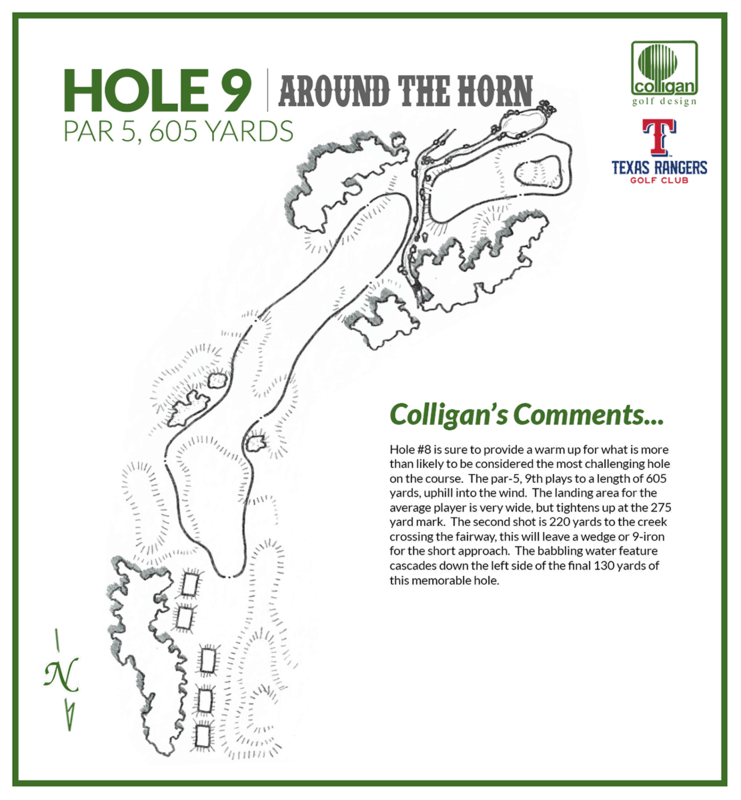 The course renovation, under the direction of famed course architect and Arlington native John Colligan, commenced in mid-December 2016. 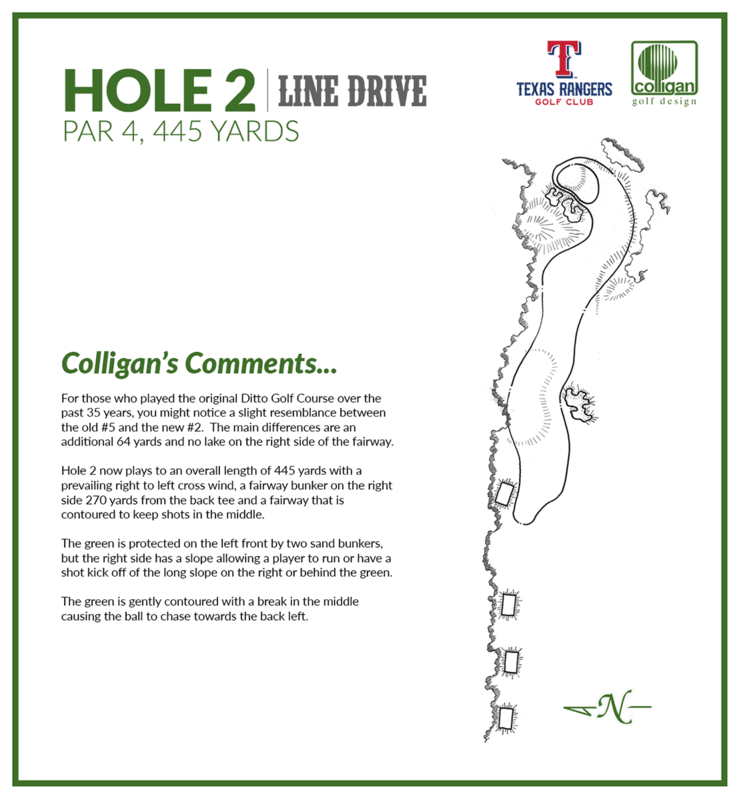 Colligan's previous notable work includes Brackenridge Park Golf Course (San Antonio), Lubbock Country Club, Stevens Park Golf Course (Dallas), Shady Oaks Country Club (Ft Worth), Mustang Golf Course (Amarillo) and Oklahoma City Golf & Country Club. 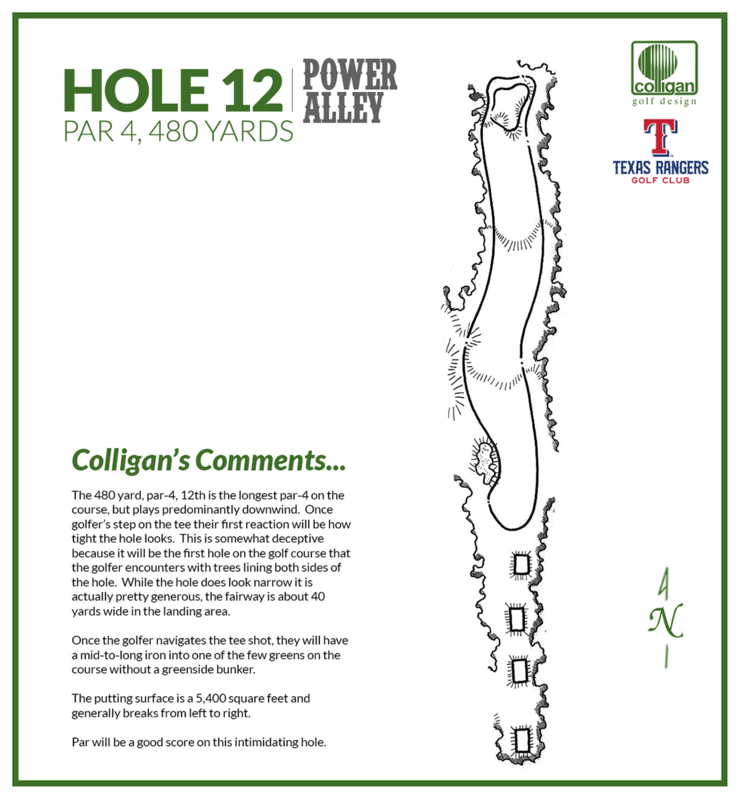 “One of the primary reasons for rerouting the course was to take advantage of the 55 feet of elevation change the site has to offer,” said John Colligan. 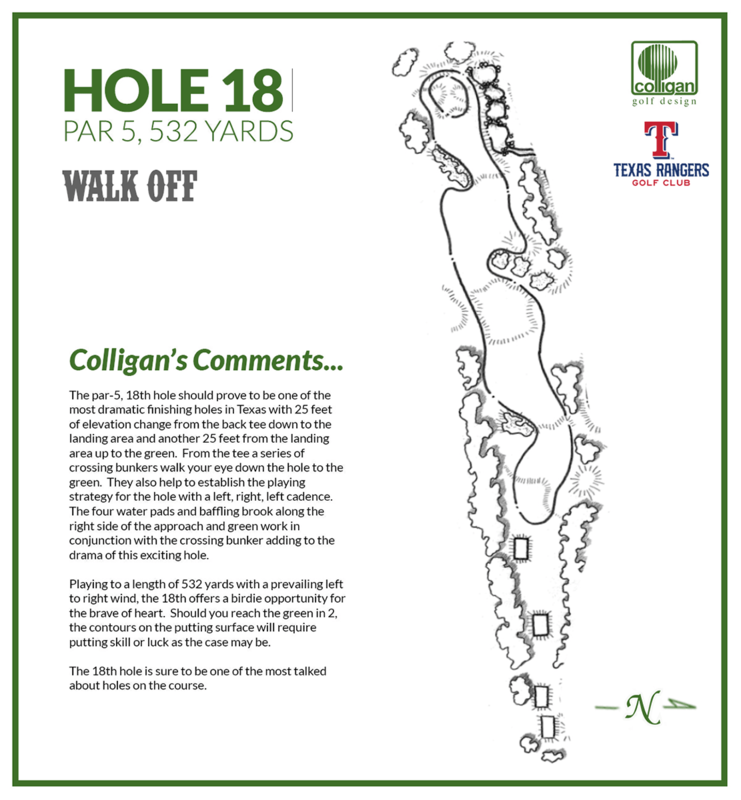 “The clubhouse is located upon the promontory of the property with great vistas to the northeast overlooking the course and out across the Dallas/Fort Worth metroplex. 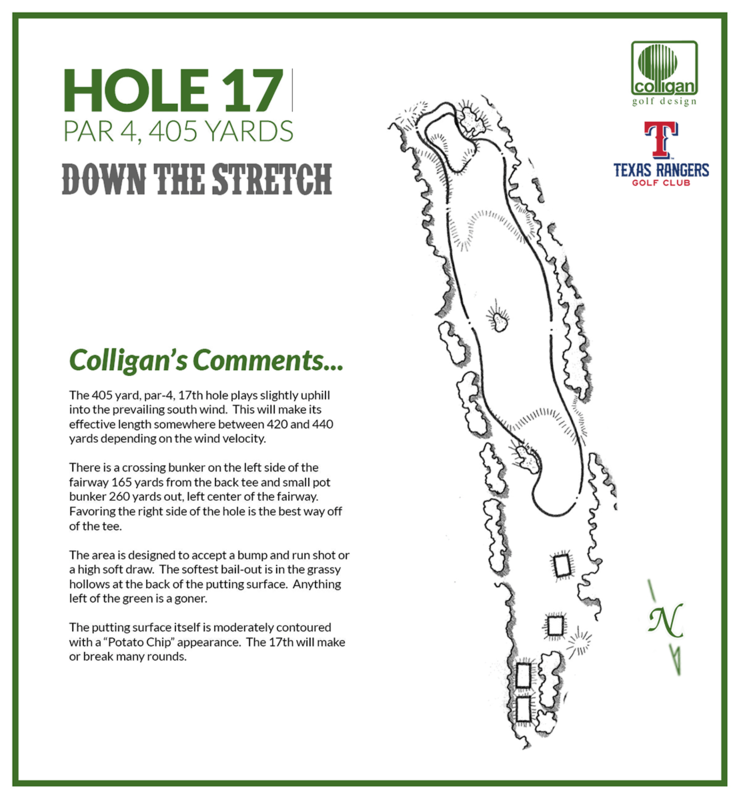 The first tee sits some 45 feet above the lowest spot on the fairway." 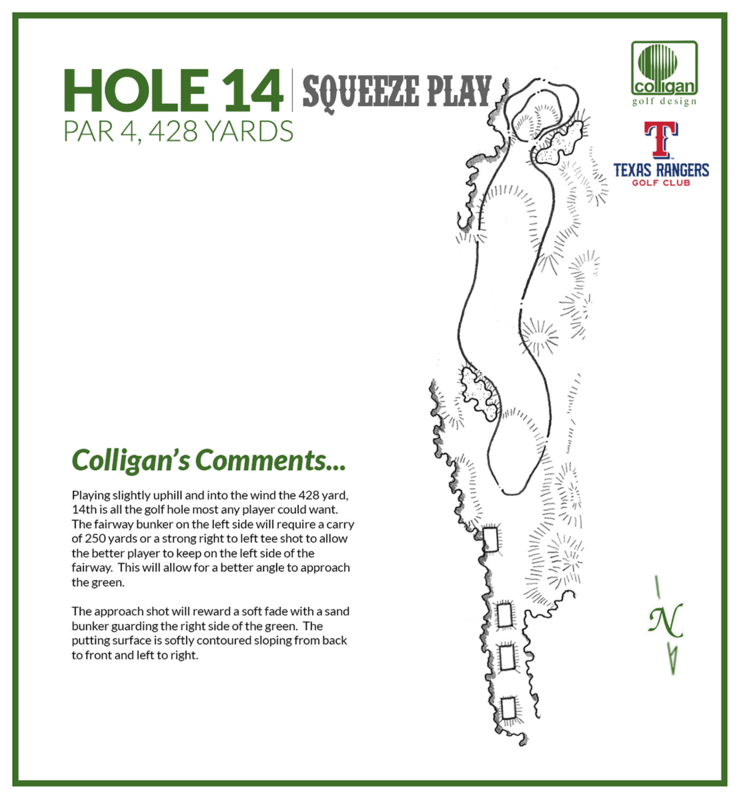 The fairways are broad and playable, and the greens are large and golfer friendly. 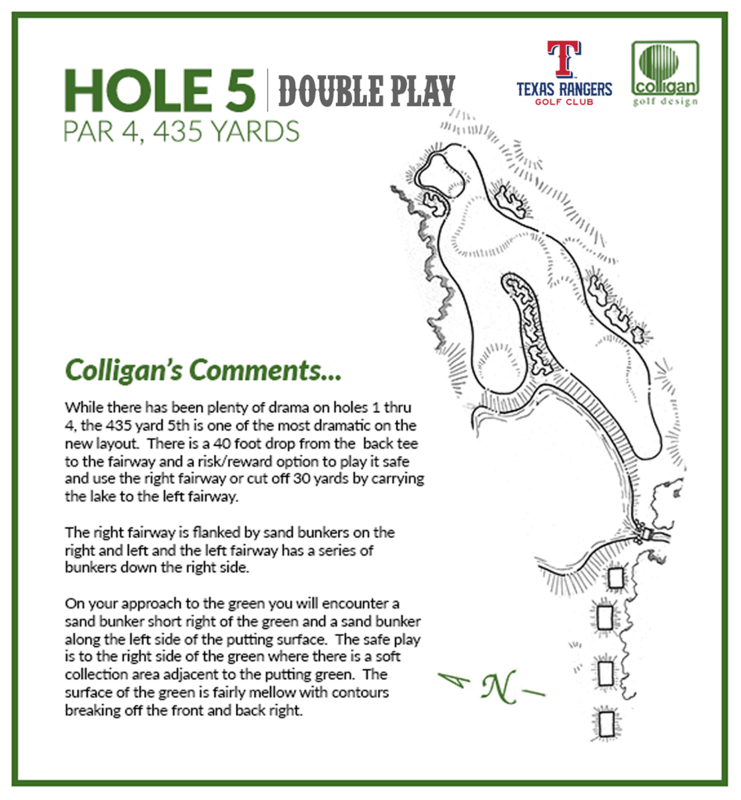 The overall scale of the course is ‘Texas Big’, and the 111,000 square feet of sand bunkers frame each hole nicely. The renovation also provided an opportunity to expand the water collection/retention ponds, and the planting of drought tolerant species, which will aid in irrigation efforts and water savings. The course will be irrigated by a combination of well water and recycled effluent water. Also aiding in water savings, is the ability to monitor irrigation patterns and schedule down to the individual sprinkler head, all controllable by a smartphone app, tablet or desktop computer. 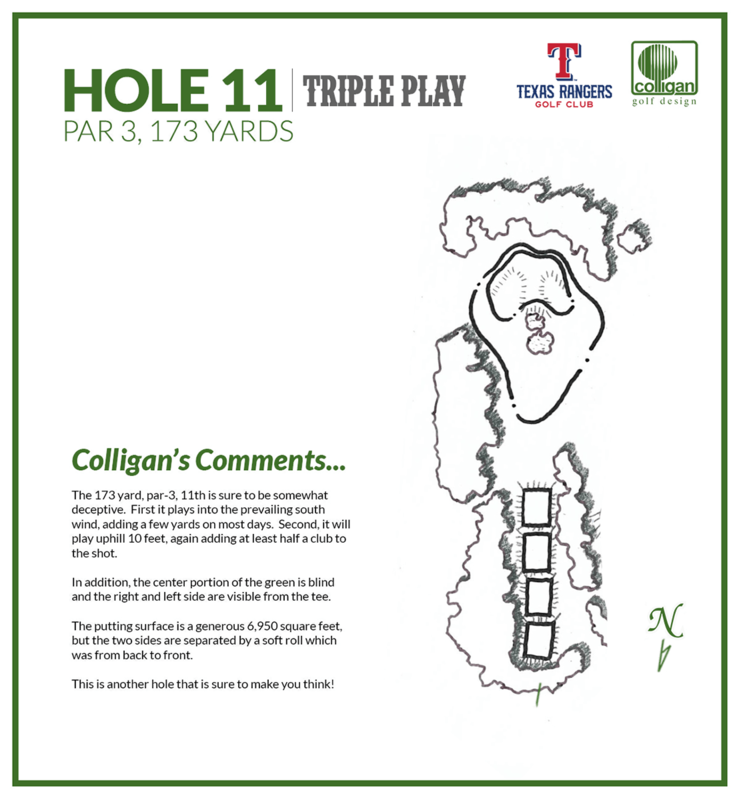 One highlight of the new layout will be a series of water features visible from both the clubhouse and numerous holes of the course. A series of four small ponds start between the 18th green and 10th tee, and another pond comes into play left of the ninth green. 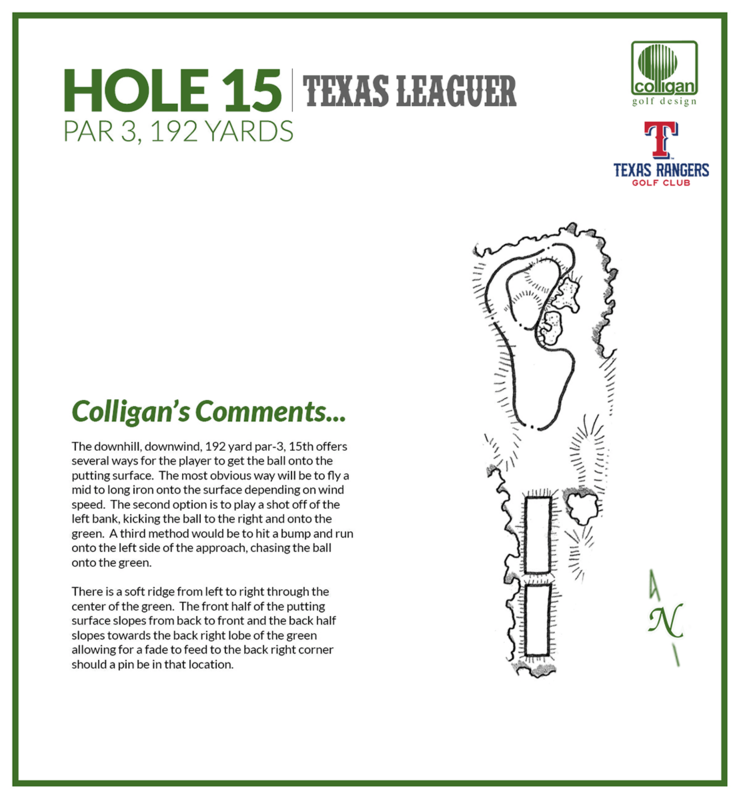 Both of these water features cascade down some 15 feet in elevation before the two streams come together on the left side of ninth fairway crossing the hole and emptying into the three-acre irrigation pond in front of the fifth tee. 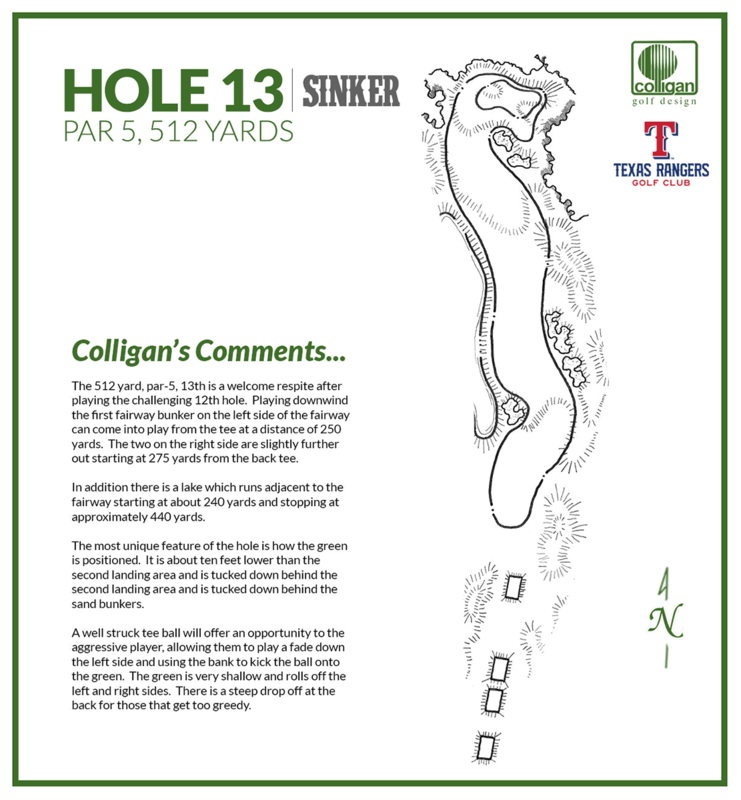 From beginning to end, the water travels 1,300 feet horizontally and 50 feet vertically to create fantastic movement and sound as another highlight of the course. 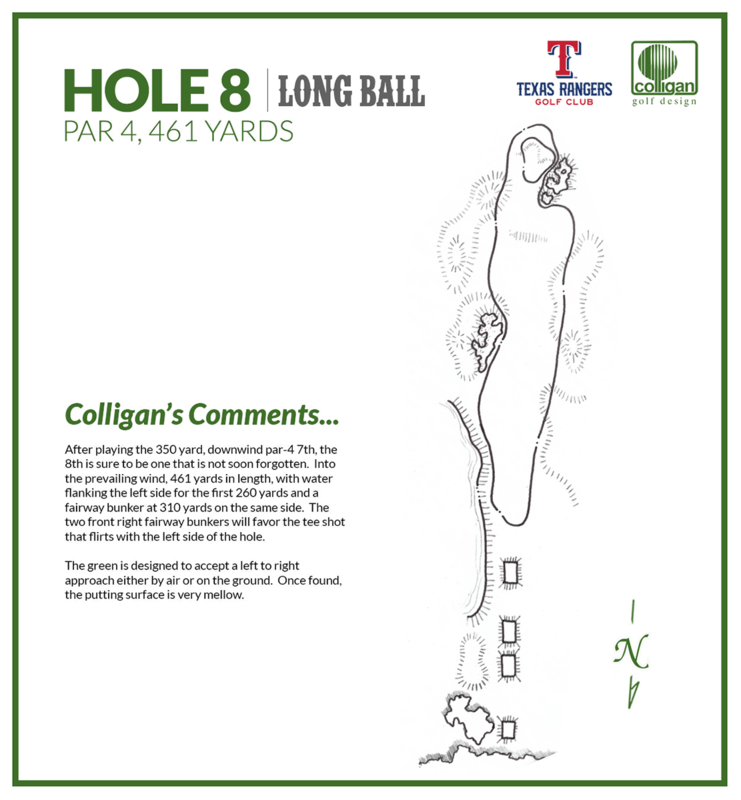 Texas Rangers Golf Club stretches to 7,010 yards for low-handicap golfers and potential collegiate events, and will feature four sets of tees to ensure a great playing experience for golfers of all ability levels. 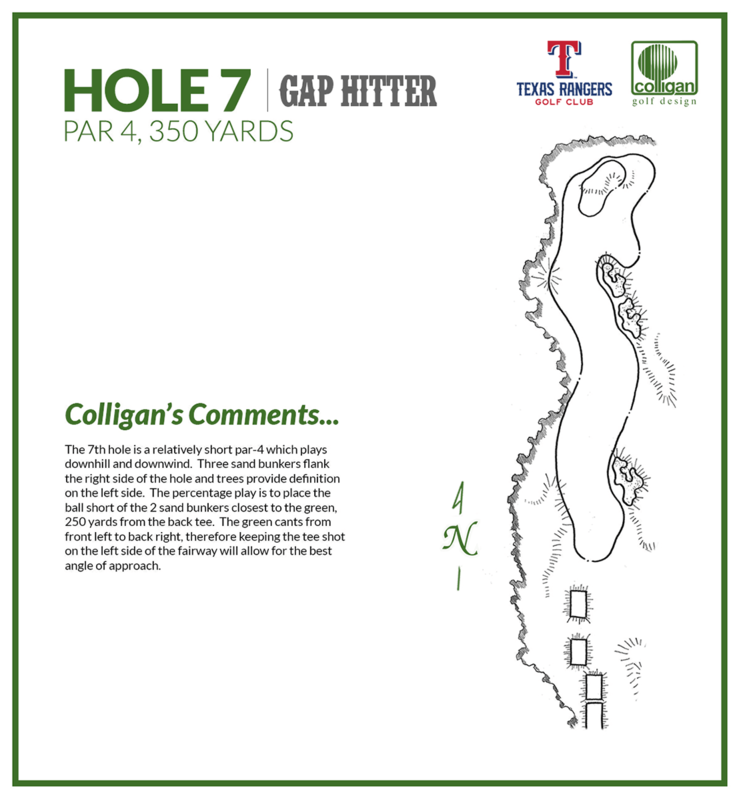 One of the largest driving ranges in the area, coupled with an expansive practice putting green and short-game facility, make Texas Rangers Golf Club a great place to learn the game or seek improvement.